Striking and innovative sales and marketing signage to maximise interest and create the right impression for your brand and your customers. 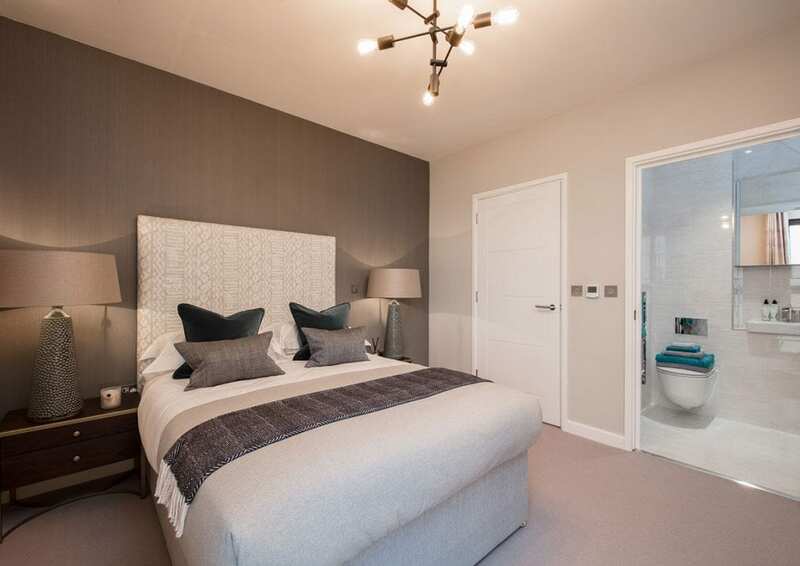 Full marketing signage, sales and marketing suite and two-bedroom show apartment for a stylish new North London development. 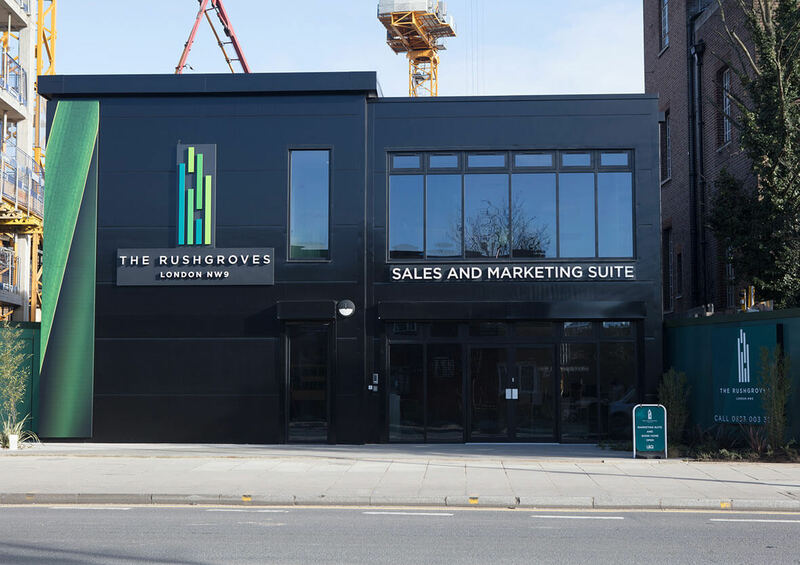 Leading UK housing association and developer, L&Q, commissioned Reade Signs to create a combined marketing suite for three sales people, a two-bedroom show apartment and full external marketing signage within their new development in London NW9. We would be limited for space, time and resources and working on a busy building site with a 25-strong team of plumbers, carpenters, plasterers, decorators, furniture movers and window fitters, so health and safety would be critical. We created a two-storey, semi-permanent structure that conveys the experience of living in The Rushgroves, while delivering its sales function. 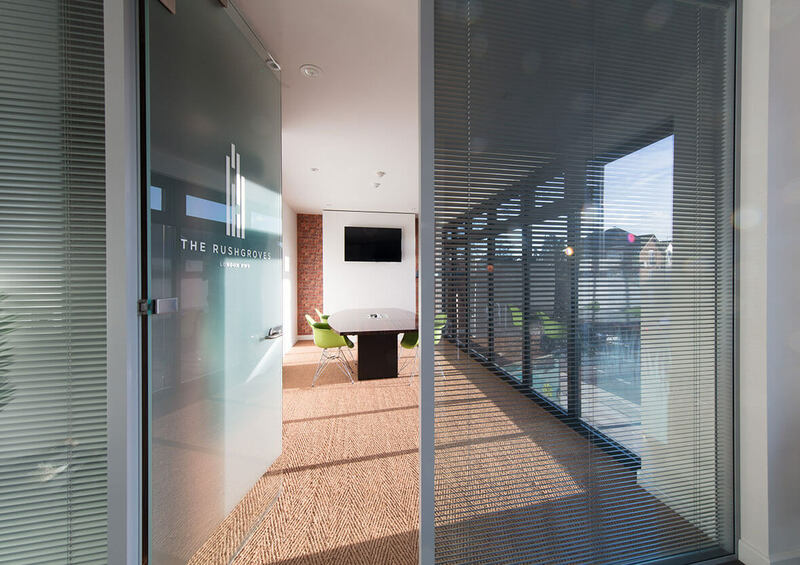 On the ground level is a welcoming area with private sales meeting room, staff kitchen and facilities. Upstairs there is a boardroom and a chic show apartment, designed with the target market in mind. We built the space and installed carpets and floor coverings. 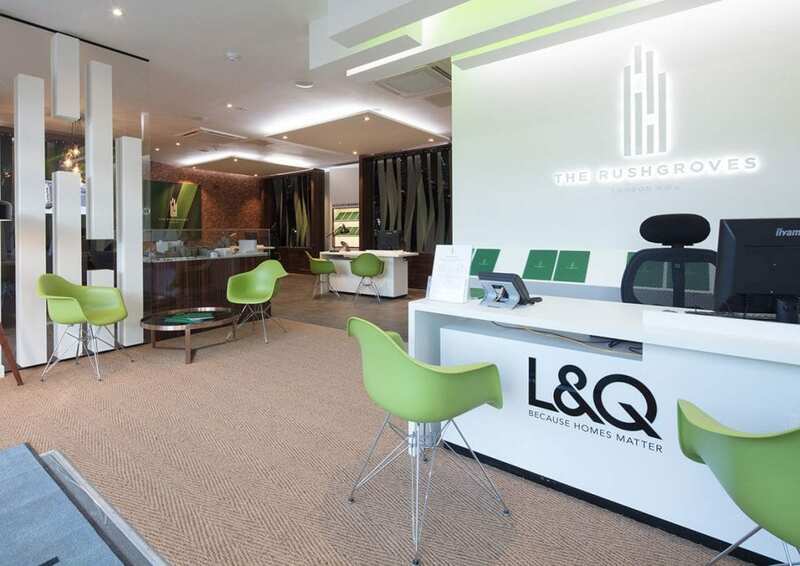 The L&Q interior designers then placed furniture, window dressings and dressed the space using modern furniture to create an edgy up-to-the-minute space, with an art deco vibe. 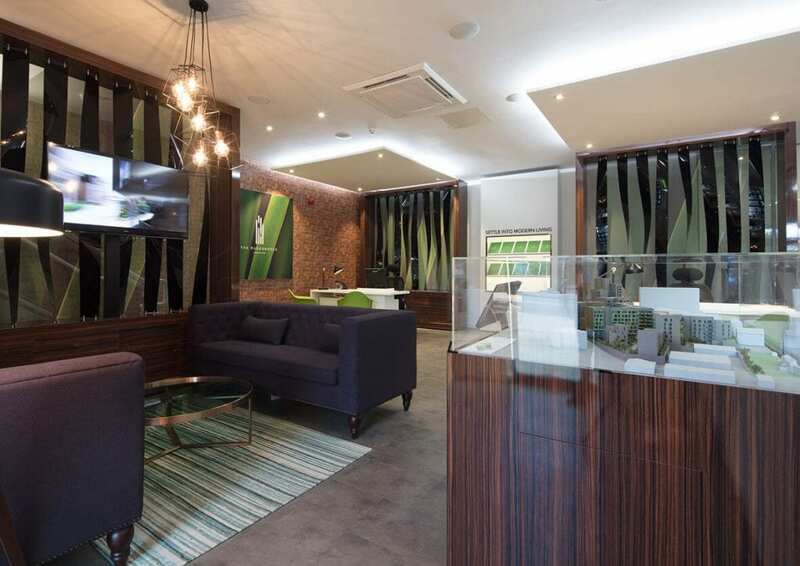 The brand is prominent throughout with attention-grabbing marketing features, including: hoarding, illuminated logos, graphics, landscaping and a water feature. 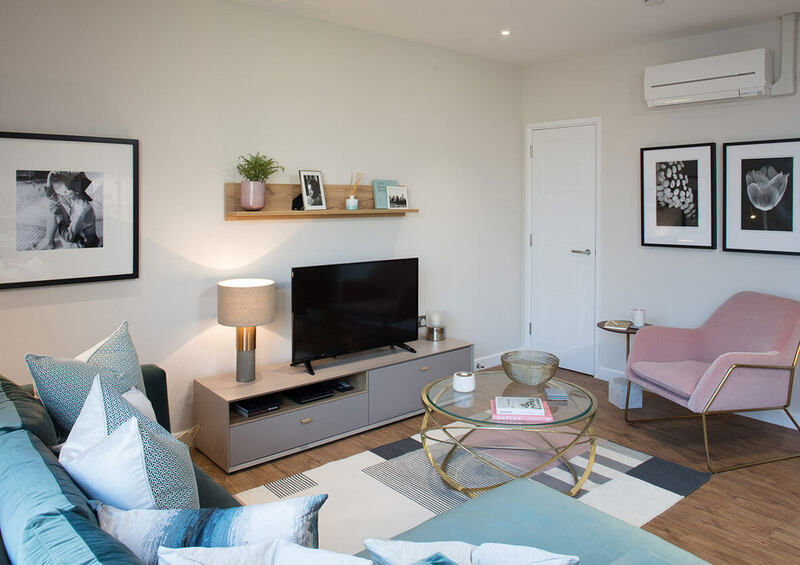 The marketing suite and show apartment was designed to help customers visualise their new home and provide a supportive and comfortable environment for staff and visitors. The sales team is now enjoying working in the beautifully designed space.